If there has been a more dangerous time for your wealth in human history we are unaware of it. There have been individual or even entire nations of people who have been wiped out in the past but never before has there been such risk to assets across the entire globe. In the past, a few savvy Zimbabweans have converted their Zimbabwe dollars into US dollars to sidestep the complete annihilation of their currency and savings. Or residents of the Weimar Republic were able to salvage their wealth and savings by stepping across the border and converting their marks into francs. 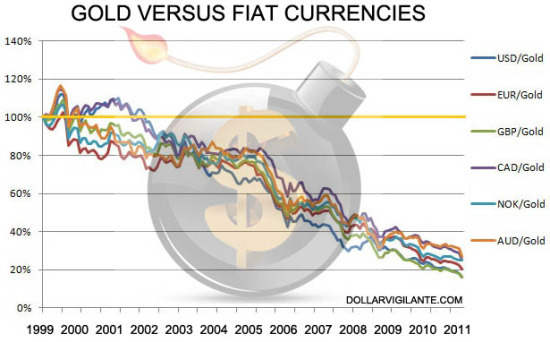 But what happens when the US dollar, the world’s reserve currency, and with it all fiat currencies collapse? It’s not an if, it’s a when. Anyone who has done even a modicum of research into the financial state of affairs of the western nation states knows that it is not only inevitable but imminent. And those who have studied the history of currencies, specifically fiat currencies, knows that they all eventually reach their intrinsic value and rarely ever last more than forty years – an anniversary that passed on August 15, 2011 which marked forty years since the Nixon shock when the US Government was bankrupted by the Vietnam war and the gold backing was taken away from the dollar. Only a relative few people have figured this out and have moved a significant portion of their savings and wealth into precious metals to avoid this confiscation for the last decade. It’s a neck and neck horse race to the bottom for pieces of paper with pictures painted on them and forced upon people to be used as money. No real money needs legal tender laws to make people use it. But, here is why it is the most dangerous time in human history for the preservation of wealth. In the past you could flee to other jurisdictions when the local currency was in collapse. But now there is no where to run. And to make matters worse almost every western nation state is colluding with the other states to limit your ability to escape. US citizens have it the worst of anyone. The US Government has been closing as many doors as possible. It has been years since a US citizen has been accepted in any other country as a stock brokerage client as the SEC has used the threat of their black helicopters to ensure that no one dare accept those with a US passport as a client. And now, with the Foreign Account Tax Compliance Act, or FATCA passed in 2010 and some of its legislation coming into effect this year, it all but ensures that soon no bank anywhere in the world will accept US citizens as clients… it’s just too risky as even not reporting one client, even if it is by accident, gives the US Government the “right” to seize a large part of that banks business. As well, most western nation states have begun information sharing agreements to track each others tax slaves across borders. As we’ve stated here before, financial privacy is dead. Now, with almost every western nation state and their socialist systems beyond bankrupt and desperately reaching with its outstretched claws to take more of their citizens assets to keep the system alive a little longer there is almost no where to hide. The US and almost every country on Earth is preparing for this and already checks everyone leaving almost every country to divulge whether they are taking more than $10,000 with them. The US has even put cash sniffing dogs at many of their international airports and accosts you as you walk to the plane to make sure you do not leave with more than a pittance of money. The next step will be to disallow you to take that money from the country altogether. At that point many western countries will have no problem pushing through legislation to confiscate gold or at least tax it at some obscene level. No one except “rich people” – the 1% – own gold as far as the public is concerned and the fascist media always likes to portray those who own precious metals as terrorists laundering money or deposed dictators fleeing from their countries. You don’t think the public won’t cheer when gold is taxed at 90% of its value or confiscated? So, even if you were smart enough to see this all coming and to divert a significant portion of your funds into precious metals you still could wind up losing everything. And herein lies the good news: International capital controls have yet to be put in place. So, you still have time to arrange your affairs to geopolitically diversify your assets to guard against the risk of any one country confiscating this last vestige of monetary wealth. How much time you have to do so is anyones guess… but time is definitely running short. But your government trained and registered financial advisor isn’t likely to tell you about protecting yourself through the purchase of precious metals. And he most certainly won’t have the knowledge to advise you on how to internationalize your precious metals. That is why we have spent the last nine months putting together a complete compendium on internationalizing your precious metals called “Getting Your Gold Out Of Dodge“. It has research and details on every facet of internationalizing your gold from listing gold vendors, storage options and transporters on every continent except Antarctica and even has dozens of anecdotes from TDV subscribers pertaining to entering and exiting numerous countries with your precious metals. If you have the knowledge and do it right it can be as simple as a mouse click or an international flight. If you do it wrong you can end up in jail in any number of countries as has happened to numerous people we interviewed. We believe the fiat currency collapse will be fraught with risks but it will also offer once-in-a-millennia opportunities for those who manage to keep their wealth in tact through the transition. Hotels could be purchased in the Weimar Republic (Germany) during their hyperinflation for one or two gold coins… the key will be having your gold and silver in a usable form and not having it confiscated until then. We are pleased to provide “Getting Your Gold Out Of Dodge” to offer everyone the chance to not only survive but thrive through the years ahead. Your government won’t tell you how to do it… and your financial advisor won’t either. It’s up to you to do your own research and be one of the few with a store of wealth in which to rebuild the world’s economy post-fiat currency. One of the best strategies for doing that is to own precious metals AND to keep them out of the reach of the western nation states as they and their man made currencies become history. I’m so glad to see this, the article itself is a gold mine because I’ve always wondered how to move gold around the world and I never knew that there were companies that do just that, in a secured way and they store it for you. Thanks!